Today is an important day for all OpenGL developers. 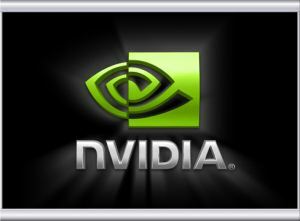 After the announce of the OpenGL 3.2 release, it’s the turn to NVIDIA to publish an OpenGL 3.2-ready piece of software: a new set of beta drivers. This new set supports Quadro FX 370, 570, 1700, 3700, 4600, 4700×2, 4800, 5600, 5800, Quadro VX200, Quadro CX, GeForce 8000 series or higher, Geforce G100, GT120, 130, 220, GTS 150, Geforce GTS 250, GeForce GTX 260, 280, 285 and 295, and any ION based products. glXCreateContextAttribsARB() does not yet support the GLX_CONTEXT_PROFILE_MASK_ARB attribute value. In order to create a Core profile context, call glXCreateContextAttribsARB(), request OpenGL 3.2 as the version, and leave the GLX_CONTEXT_PROFILE_MASK_ARB attribute out. In order to create an OpenGL 3.2 Compatibility profile context, call the “old” glXCreateContext() entrypoint. Note: wglCreateContextAttribsARB() does support WGL_CONTEXT_PROFILE_MASK_ARB. GL_ARB_depth_clamp: ARB version (OpenGL 3.1) of the old GL_NV_depth_clamp. Useful with stencil shadow volume. pixel-center convention is half-integer and the fragment processing origin convention is lower-left. enabled (GL_FLAT). The provoking vertex of a primitive is the vertex that determines the constant primary and secondary colors when flat shading is enabled. GL_ARB_vertex_array_bgra: this extension allows to fetch a vertex component (mainly color componant) from a Direct3D color array where color is stored as BGRA. This extension avoids to perform the swizzling in the vertex shader. WGL_ARB_create_context_profile: not yet documented but I guess this extension allows to create a OpenGL 3.2 rendering context with a specific profile (Core Profile or Compatibility Profile). WGL_NVX_DX_interop: not yet documented. Seems to provide some Direct3D to OpenGL or OpenGL to Direct3D interactions. For OpenGL 3.2, the OpenGL ARB has introduced two profiles. The Core Profile and the Compatibility Profile. A profile is a well defined subset of the OpenGL specification. The Core Profile is built on top of OpenGL 3.1 (without ARB_compatibility). The Core profile does not support any deprecated features. The Compatibility Profile is built on top of OpenGL 3.1 including ARB_compatibility and thus provides full support for all features, including the deprecated ones. 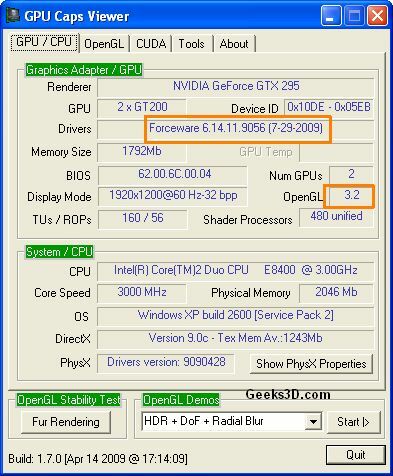 Display drivers 190.56 exposes 190 extensions (for a GeForce GTX 295). The extensions exposed by old ForceWare drivers are available HERE. 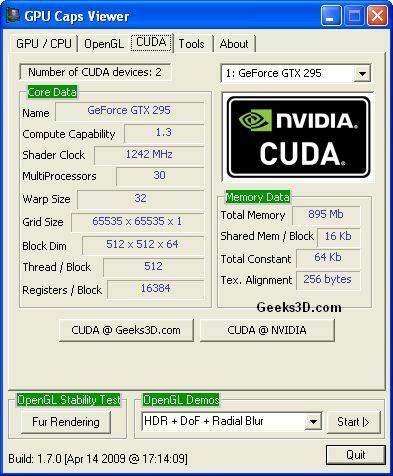 You can use GPU Caps Viewer to retrieve the list of extensions of your graphics card. 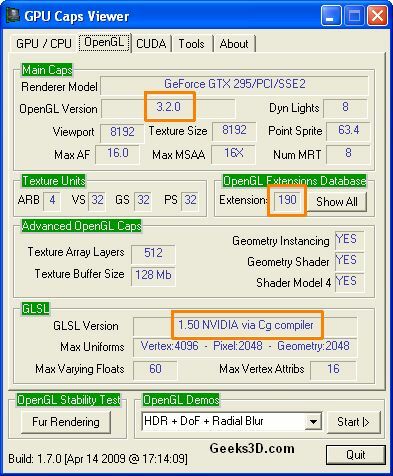 NVIDIA ForceWare 190.15 Brings OpenGL 3.1 Support And New Extensions! Seems to be an OS limitation? I installed on Vista64 successfully. There could be trouble if your previous driver is very old. They changed the installation of the control panel with recent versions.